Control and Protect Your Company's Assets! WORKMASTER® Electric Motor Starters feature best-in-class components, superior construction, and ease of installation. These units minimize motor failures, nuisance tripping, and plant downtime. WORKMASTER® Motor Starters combine the best of these various elements: NEMA rated enclosures, best-in-class contactors, solid-state overloads, rugged switch bodies with gold-flashed contacts, together with careful, rugged construction, and wire-labeling, all recorded on easy-to-follow schematics to provide the best means of controlling and protecting the “muscle” that powers your plant operations, and keep production flowing. We offer a standard line of full-voltage Starters, which are manually (pushbutton) operated, and also a line of externally activated Starters, which are designed to be interlocked with nearby equipment. Equipped with metal housings, and gold contacts to eliminate corrosion. The Push buttons are IP65 rated dust-tight and hose-down proof. START button is LED illuminated when motor is energized. Protects and secures the wiring harness across the enclosure’s door to prevent pinched, worn wires. Provides a load-life durability profile of more than 10,000,000 operations. Used throughout to assure long-life, and each wire is clearly labeled for fast, easy identification. Grounds terminals to assure operator safety. Simplifies testing, troubleshooting, or modifying the number labeled wiring. Keeps wiring tight and organized while providing “touch safe”, convenient, meter-probe test points. Minimizes nuisance tripping or failure. This state-of-the-art overload even detects phase loss, while generating far less heat, saving energy and extending life. Auto-reset assures motor 3-minute cool-down. Meets NEMA 3, 12, 4 and 4X Standards which means it’s dust-tight, hose-down grade and corrosion resistant. Motor Starters are used to both protect and control industrial electric motors. The control can be manual, in the form of push button controls (START and STOP), interlocked with nearby equipment (sometimes called “slaved”), or activated by a PLC, or PC (normally done through a communications interface). The Motor Starter can be equipped with a multi-position selector switch that allows an operator to choose how the motor will be controlled, eg, a HAND – OFF – AUTO switch. The HAND position can either allow push buttons to control the motor, or when equipped with momentary spring return, allow the operator to momentarily test run the motor. AUTO would be the normal operating mode, with the motor controlled by external activation, such as synchronization with the powering of an adjacent electrically controlled device. Regardless of the type of control, the device that initiates the energizing of the motor is called a Contactor. A Contactor is a special form of relay, which has been designed to control higher voltage and/or higher amperage equipment. The Contactors used in WORKMASTER® Motor Starters are approved by NEMA (National Electrical Manufacturers Association), IEC (International Electric Commission) and UL (Underwriter’s Laboratory), and have been sized so as to provide both large amperage capacity and longevity. Our rugged, NEMA-Rated Contactor makes and breaks all three legs of three-phase power to control an industrial motor. Within its broad amperage capacity range, it can “make or break” the connection of power to the motor millions of times, before requiring repair or replacement. The output of the contactor is normally NOT sent directly to a motor, but instead the output is sent through an Overload Relay, which is often just called an Overload. As the name implies, this is also a special form of relay, which has been designed to interrupt the energizing of a motor, prior to the motor suffering from excessive power for too long a time period. The combination of excessive power and time causes heat generation beyond the Motor’s ability to dissipate it — the cause of most motor failures. Another cause of motor failure is: loss of phase. If one of the legs of 3-phase feed to a motor is interrupted, the motor will continue to receive power through the remaining two legs, but the motor will have no torque. The stationary or coasting-to-a-stop motor will draw excessive power, similar to the power surge that takes place when a motor is started. Another term used to describe loss of phase is: single phasing. Single phasing is another common cause of 3-phase motor failure. The original designs of overload relays used “heaters” (reset-able conductive elements), which model the heat buildup in the motor by heating up themselves. If the heater is the correct one, and is working properly, it will interrupt the power sent to the motor prior to the motor suffering damage. After cooling off, the heaters can be reset, and allow the motor to be re-energized. 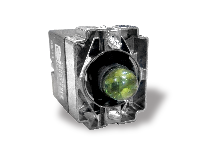 Our solid-state overload electronically stimulates the heat build-up in the motor. Power exceeding a motor’s nameplate rating for too long a time period will trip the overload, turning off and protecting the motor. Loss of phase is detected by this overload within several seconds, further protecting the motor, without having the subject the motor to high amperage and heat, and then de-energizing it. Reduced power consumption (by a factor of 10) which results in energy savings and also reduces heat build-up in control cabinets. More accurate modeling of motor over-heat conditions, which reduces motor failures without “nuisance tripping”. Greater reliability because their design is electronic, not electro-mechanical. Ability to detect loss of phase and trip within seconds, which is well before motor damage could occur. Industrial operating conditions are often challenging to manually operated controls. A combination of rugged mechanical design and anti-corrosive switch contact material is ideal. Corroded contacts in switches interfere with operation of a motor and also cause intermittent momentary contact–so-called “relay chatter”. When a motor is subjected to this erratic form of powering, the possibility of motor damage greatly increases. To address these issues, WORKMASTER® uses a line of industrial pushbuttons and switches that feature NEMA 4 / IP65 ratings and metal switch bases (which are automatically bonded to the enclosure) are equipped with contact blocks with gold-flashed contacts. These rugged industrial switches feature LED illumination and gold-flashed contacts, maximizing their longevity and minimizing their maintenance requirements. 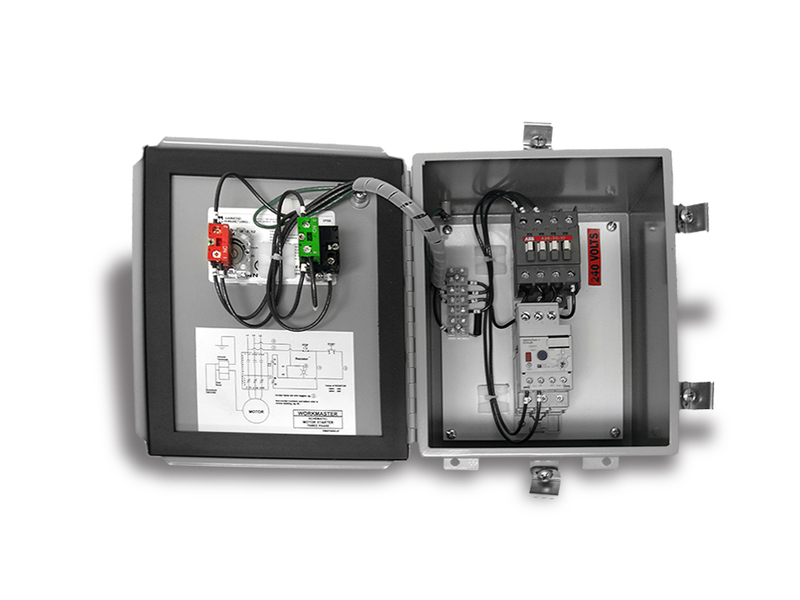 With metal bases that are automatically electrically-bonded to the enclosure door, and bayonet-style engagement of the pushbutton operators, these are among the most rugged industrial switches available. The illuminated versions of these switches or pilot lights use LED illumination, which is the most reliable form of illumination available, lasting far longer than incandescent or neon illumination, while consuming less power. Using LEDS, the likelihood of pilot light burnout is virtually eliminated.